There are places in the world which slowly disappear, bound to exist only in collective memory. When this happens, the past can be idealized by those who remember it. What no longer exists acquires a wonderful nature, it becomes magnificent. It is recounted to new generations with nostalgia, and they too will grow with the idea that yesterday was a fairer place than today. The petrochemical area of Siracusa is one of these vanished places where the past struggles to reconcile with the present. The two times exist in parallel, without ever meeting. The inhabitants of Augusta, Priolo, Melilli and Siracusa live between their history and their present. They feel victims of their present condition, and everything around them contributes to the idealization of the past and to the discouragement for the future, which remains uncertain. The triangle of death. This is how the area along the eastern coast of Sicily is known today. The same area where a carefully designed industrial development was put in place in order to impress Italy and the Western world. The resulting petrochemical area was to serve as an example to the developed world, a loud and clear message of how Italy could compete with the great industrial powers of the time. The challenge was to make the country autonomous in the extraction, processing and exportation of oil, and to do all this in the poorest region of Italy: Sicily. A challenge successfully overcome and welcomed with enthusiasm by investors and workers. No one had expected that enthusiasm would then turn into pain, disillusion, anger and helplessness years later. Were it not for historical documents which, with typically fascist tones praised the emerging industry in Sicily, it would be hard to believe these places have gone through so positive times. The whole area is victim of a structured dichotomy: on the one hand, the awareness that without these industries there would have been no way out of unemployment, poverty, hunger, ignorance and fear. On the other, the certainty that those industries and their corrupt, blind and insatiable management meant that a whole section of Sicily now lives in the shadow of cancer, newborn malformations, unemployment, and the anger for having been grateful to their tyrants. Industrial development has represented nothing more than a deception to these inhabitants. The contrast that characterizes these places is also evident to the senses of a foreign observer. The natural landscape has preserved its Mediterranean beauty, with its shades of red, yellow and green. A peaceful, beautiful view. But also interrupted by the gray giants of metal and iron, by the black smoke they release in the air, and the unbearable smell of burnt raw oil. Sea water, in some coastal areas near the industries, is foamy and red. Everything is a sign of how the past, although economically poor, has been intoxicated by development. The petrochemical area of Siracusa was a titanic enterprise, welcomed by its entrepreneurs with the same fervor with which the world welcomed the landing on the moon, with the same certainty that that goal would have marked a new era of development. Only current generations can tell us what the real cost of that progress ended up being. "Men and women going towards a safe job for a splendid future"
<<Today, I think back to that time we can consider far, the immediate postwar period, when no one believed in the real possibilities of our subsoil.>>. This is how Enrico Mattei- former president of ENI- began his speech on 27 October 1962 in Gagliano Castelferrato, near Enna, in front of a crowd of Sicilians full of hope for the industrial future of their land. That speech would have been remembered a few hours later as Mattei's last public talk. The jet he was traveling on from Catania to Milan together with pilot Imerio Bertuzzi and Time-Life Magazine’s American journalist William McHale, exploded and crashed that same afternoon in the countryside of Bascapè. The circumstances of his sudden death were suspicious and led to assumptions about a possible assassination either by the Sicilian Mafia, or by the secret services of the United States, to the extent that case of Mattei was soon after included in the list of Italian mysteries. The same Mattei who had strongly wanted the nationalization of oil in Italy, breaking in fact the balance- unquestioned until that moment- of the cartel called the Iran Consortium, formed by the seven companies that controlled the world oil production, which Mattei referred to as the Seven Sisters. It was Mattei who imagined that the Sicilian subsoil could be rich in raw materials, especially oil. 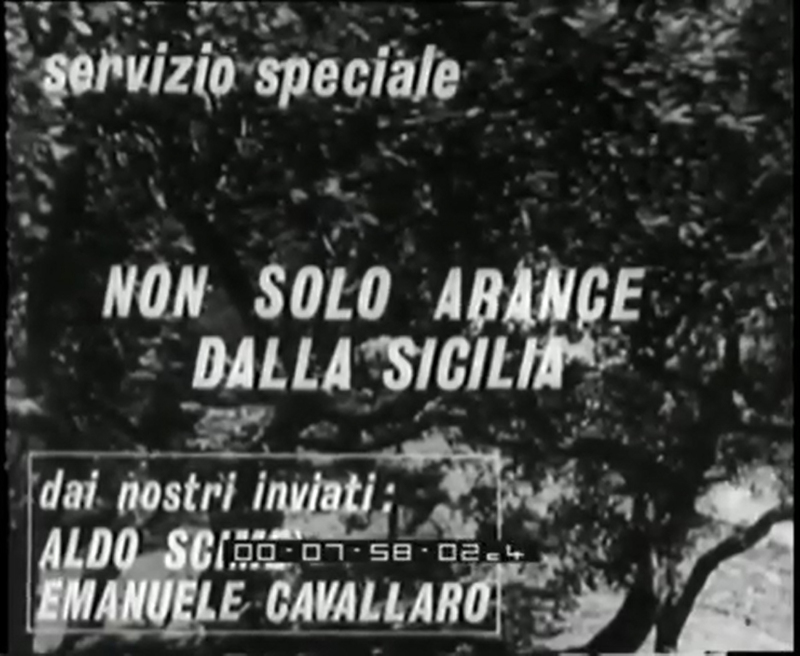 In his famous public discourse of '62 he referred to the idea, tempting for Sicilians who had suffered economic and social isolation for years, that Sicily was "a land hiding goods". A possible development therefore, most importantly autonomous and to be discovered. After obtaining the necessary permits to carry out explorations in the Sicilian sub-basins, in 1956 ENI found oil near Gela. This is when Mattei started cooperating with another decisive character of Sicily’s industrial development, Angelo Moratti. Driven by an imagination as fervid as Mattei’s, Moratti founded the first Italian refinery in 1948: Rasiom, acronym of Sicilian Refinery Mineral Oils, together with Falck. He chose Sicily as the new refinery’s location, and more precisely Augusta. The region holds in fact a strategic position in the Mediterranean, being located on the Middle eastern oil route, labour cost is among the lowest in the country, and the town of Augusta is equipped with a sheltered bay as well as a large military base with precious equipment for Moratti’s project. The founding of Rasiom officially started the process which, over approximately 70 years, saw eastern Sicily go from being an exclusively agricultural area to home to one of the largest petrochemical plants in Europe. Moratti’s role in the industrial process ceased in 1962, the same year as Mattei's last speech, when Esso, until then the largest refinery customer, acquired Rasiom. From that moment on, the process of industrialization followed a fairly quick development, until the early 1970s with the building of Montedison, the Enel thermal power plant, the Erg gasification plant, and finally the ISAB refinery, whose construction saw a whole town being demolished in 1979: Marina di Melilli, today in the list of Italian mysteries just like Mattei. His last resident, Salvatore Gurreri, who refused to leave his home, was brutally murdered in 1992. Already in the late 1970s, factories began to face ever-increasing competition from new producing countries such as China and India, which offered lower prices. Gradually, the petrochemical area of Siracusa fell again into the nightmare of unemployment, youth emigration, and of worryingly high rates of cancer deaths. The latter were mainly a consequence of the lack of ecological awareness during the golden years of the Italian oil revolution, and to an often corrupt and uncontrolled management of the industries gradually arising in the area. A bright past then, which looks today like a combination of disillusionment, anger and fear. How did an area that showed so much potential fall back into economic downturn in such a short time? Why did the industries work undisturbed? Why does a whole area of Sicily die slowly and in silence? Was Enrico Mattei really killed? What is the link between his death and the role of Sicily in the national oil market? History does not seem to provide an answer to these questions. For the citizens of the triangle of death, the illusion of having walked on the moon is still fresh. The citizens of Augusta, Priolo Gargallo, Melilli and of all other towns bordering the Sicilian industrial area, have something in common. It is their way of relating to the loss of beloved friends and family members. <<Mirabella Santo, pancreas. Mistretta Rosalia, lungs. Montagna Agata, colon. Montagna Ermelinda, marrow. Morello Attilio, colon. Morello Domenico, prostate.>>. These are just few of the names of victims of cancer which were read by citizens of Augusta during a public demonstration on 28 April 2016. Peacefully but firmly they were protesting against the Italian State’s indifference to their pain. The same indifference which contributed to the present circumstances, whereby industries have dumped over years toxic substances illegally in the same territory where innocent people live, build their families, eat and breath. They want the industries to be held responsible for their illicit actions over seventy years of uncontrolled industrialization, to run the necessary recovery of the land, to pay back the families of the victims of cancer and congenital malformations caused by pollution, or simply to admit their mistakes. They also want the industries to put in place safety measures for the workers, which often lack despite the nature of the job presents high risks in terms of life and health. Father Palmiro Prisutto is the head of these protests, which he has organized for years now. Originally from Augusta, he too has suffered the loss of families and friends due to cancer and pollution-related disease. <<We are victims of an institutional blackmail. Human life and health cannot be bought or exchanged for money.>>, he says in front of citizens. He refers to the many people who have scarified their health and life because getting a salary and feeding their family was more urgent than being well and safe. According to the World Bank, since 1987 Italy is among the seventy-eight countries recognized as high-income. To use a controversial term, Italy with all its Regions, is a fully “developed” country. The United Nations refer to a “human development index” to stress how the development of a nation should be measured taking account of the combination of several factors, such as the levels of education, national mean income, and life expectancy. What matters in other words is not just the quantity of life, but also its overall quality. The towns of the petrochemical plant area have both a quantitative and qualitative issue. Many- too many if compared to the national average- die relatively young and the quality of their life is low. The rate of deaths due to cancer, and of malformations at birth, is among the highest in Italy. These are professional diseases. Who gets sick is often the men who have worked inside factories and industries for years. Like Salvatore D’Amico, from Augusta, who was only a child when Moratti was gradually working to make his industrial dream a reality in Sicily. He was a child of the newly born industry, one of the first to attend the new industrial professional school of the area, CIAPI, in Priolo Gargallo in 1966. He began working for the mechanic factories of the Sincat, and he worked there for twenty-seven years. Until 1996 when the first disorders at his stomach appeared. After years of clinical tests and suffering, he was finally diagnosed with colon cancer in 2013. <<I always live with one question in mind: How ling will it last?>>, Salvatore recounts in his house in Augusta. <<Life was hell inside the industries, we were always afraid something could go wrong and we could get hurt because we were not provided with the necessary safety measures. But we had no choice, the need to work was stronger than our fear to get ill or die>>. These are environmental diseases in a more generic sense, as those who get ill are also men, women, and children who did not work directly for the industries. Over the course of years the citizens of this whole area have been exposed to poisonous air, soil, and water. It’s a poison which cannot be escaped. Towns are surrounded by refineries, plants and power stations releasing highly toxic substances into the atmosphere, soil and water. National and European laws foresee a minimal safety distance between industries and inhabited centers. But these industrial complexes were founded and built long before Italy signed environmental laws. Hence industries here are today too close to towns. <<My mother told me how one day, three months into her pregnancy, she heard a strong explosion and saw black smoke all around her house in Priolo. It was then discovered that that smoke came from the explosion of two oil tankers which released 4,500 cubic metres of raw oil into the atmosphere, in other words polycyclic hydrocarbons. She inhaled considerable quantities of them over days. I was born six months after that explosion and immediately underwent surgery because for my spina bifida>>, says Giusy Chiaramonte, originally from Priolo Gargallo. She moved to Città Giardino with her husband and children few years ago to get away from the pollution produced by the Isab North and Isab South plants, owned by the Lukoil company and confiscated by the prosecutor’s office of Siracusa in July 2017. Giusy suffers from myelomeningocele, a congenital malformation of the bone marrow which can lead to serious neurological dysfunctions such as paralysis of the lower limbs, muscular atrophy, and meningitis. Today, she conducts a daily battle to raise awareness about these issues, asking that local industries clear the lands they have exploited for years. <<I am not after financial compensation as no sum could ever give me back my health. What I pretend from these pollution monsters is that they give us our land back, for me and for the future of my children>>. Dr Mara Nicotra, researcher in ecology and marine biology, carried out specific studies on the conditions of the territory of the petrochemical plant. In particular, she was commissioned a scientific investigation on the levels of pollution of the harbor of Augusta by the municipality of Melilli. <<Prior to the decree 152 of 1999 concerning the treatment of urban waters and the protection of water from pollution, and due to the lack of an official monitoring system, the industries located in these lands have drained their substances in our sea over fifty years of wild industrialization, basically treating it as a tank. We knew very well that the water was contaminated by heavy metals, polycyclic hydrocarbons, and other toxic substances, but no consistent study had ever been envisaged to quantify this pollution and in particular to examine any correlation with industrial activity>>, Dr Mara Nicotra explains. The study conducted in 2003 allowed Dr Nicotra to find high concentrations of mercury, as well as of arsenic, in the harbor of Augusta. Such levels are clearly dangerous for the health of populations which for years have fished in those waters for private consumption. <<Before I started the study on the harbor of Augusta, I had received several visits from worried citizens who had bought and cooked local fish whose spines were evidently malformed. Some of them presented Y-shaped spines, while others were too thick. In other words, they all had suspicious malformations. It didn’t take us too long to link those abnormalities to the industrial pollution>>, Dr Nicotra says. Thanks to her study, and to the investigation of the prosecutor’s office of Siracusa which confirmed her findings, the Ministry of the Environment allocated the first round of funding in 2005 for the recovery of the harbor of Augusta. Even though the Ministry had established that half of the funding was to be provided for by local industries, none of them cooperated. Finally, the recovery was interrupted by the prosecutor’s office itself because it was considered “risky”. <<The prosecutor’s office said that the dredging methods at our disposal at the time were not sustainable from an environmental point of view, and that there was a high risk of causing toxic substances to resurface and damage the water and fish even more. Still today, things haven’t moved.>>, recounts Dr Nicotra. Today, the citizens of the whole industrial area feel they do not count for their country. They are still waiting the moment when they too perhaps will disappear. <<Maybe one day, like for Marina di Melilli, our story will be told: Once upon a time there was Augusta>>, reads one of the banners at the public protest on 28 April 2017 organized by Father Palmiro Prisutto. There are places in the world which slowly disappear, in silence. The towns of the petrochemical plan of Siracusa risk to disappear every day, but their people still have a lot to tell. Their fights keep the dignity of a whole area of Sicily alive. It is in this way that they keep walking on the moon.